The Erie Otters have finally found that winning formula. Captain Dylan Strome and OHL defenceman/overage player of the year Darren Raddysh have both been part of the Otters since 2013 and leading into this year, they were part of some very strong teams. Erie made it to the Western Conference finals in 2013-14, the OHL final the following year and made another Western final last year. The Otters bowed out to the last two Memorial Cup champions (the Oshawa Generals and London Knights) before this season and last year’s sweep at the hands of the Knights had to have left a bitter taste in their mouths since Erie was the top-ranked team after the regular season and finished with an early exit instead. 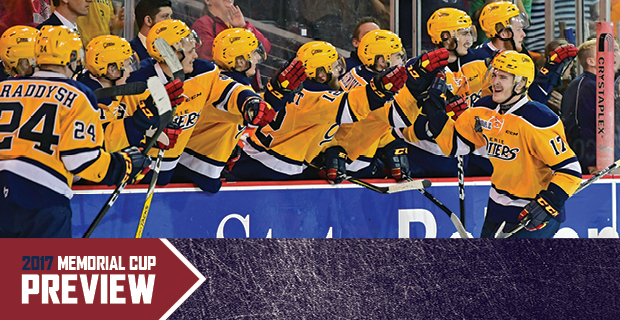 Now, the Otters finally have gotten over the hump after claiming that elusive OHL crown. They got past the resurgent Mississauga Steelheads in a five-game series where all but one game was decided by a single goal. It’s now a case of how much further they can go once they get in the mix with the country’s best in Windsor. They were a juggernaut all season thanks to a roster headlined by OHL leading scorers Alex DeBrincat and Taylor Raddysh. They were even at the top of the league standings on Nov. 20 when Strome was sent back to major junior after starting the year with the Arizona Coyotes. While he has a bright future in the desert, he wasn’t utilized much in the NHL and some time on a championship team must be what the Coyotes wanted to see from one of their core prospects. Nearly a month spent as captain of Team Canada at the World Junior Hockey Championships couldn’t hurt either. As a top contender in the OHL West for the last few years, the Otters have made a number of attempts to bolster their line up with blockbuster trades. Past notable additions include Nick Baptiste, Remi Elie and Brendan Gaunce. This year however, they struck gold with Anthony Cirelli and Warren Foegele leading up to the trade deadline. DeBrincat led the league in playoff scoring with 38 points, followed by Strome with 34, both of them through 22 games. They put up impressive performances no doubt, but it was Foegele and Cirelli who came through the most in key situations. Foegele was captain clutch and earned playoff MVP honours after recording eight points (including a five-point game) in the five-game championship series. He also propelled the Otters past the Knights with the overtime winner in Game 7 of their Western semifinal. Cirelli’s developed the clutch performer reputation as well ever since he scored the overtime winner as part of a two-goal effort for Oshawa in the 2015 Memorial Cup final. He came through with another championship-clinching goal for Erie, once again in overtime as the Otters came back from a 3-1 deficit to defeat the Steelheads 4-3 in Game 5 on May 12. Not to be outdone, Taylor Raddysh had a hat trick in the game, tying it in the dying minutes with goalie Troy Timpano pulled for the extra attacker. While it’s a safe assumption players like Strome, DeBrincat, Cirelli and Erik Cernak will be moving on to pro hockey, we do know for certain that Darren Raddysh, Foegele and Kyle Pettit will be moving on as this year’s overagers. A Memorial Cup would be a perfect ending for them, especially Raddysh, who put together an 81-point regular season, followed by 22 playoff points. The Otters made it to the Memorial Cup once before in 2002, when stars like Brad Boyes and Carlo Colaiacovo led them to the OHL final. That year at the national championships in Guelph, they went 2-1 through the round-robin before they were knocked out in the semi final by the Victoriaville Tigres after a 5-4 overtime loss.